[[fair warning: this story is anecdotal and based on a few memories at a time that is now 3:34 a.m. or 2:34 a.m. now at the daylight or eastern standard time whatever – and more than subject to change once the players are back from the Canadian beers at the afterparty] – and photos or video to come may just prove us totally wrong as usual]. The Motor City team may not be the force it once was but its influence has spread through the state. [Don’t forget that little movie shot around there in Grand Rapids]. And it has definitely hit Mid Michigan Derby Girls whose mission statement is just as bold as any other league in Derby, This organization, Mid Michigan Derby Girls is Eastern/Mid Michigan’s premier all-female, flat track; not for profit, skater owned and operated roller derby league. 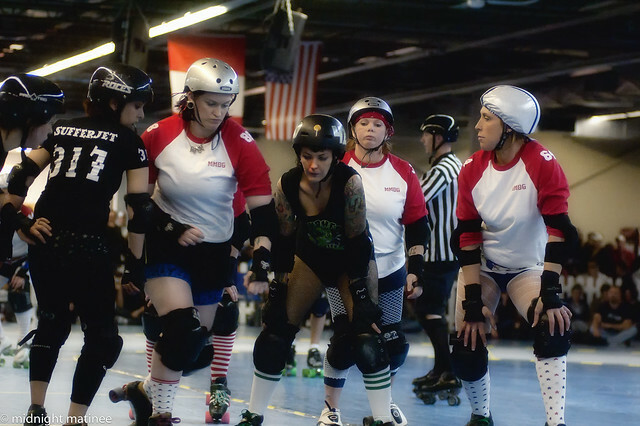 Our goal is to bring roller derby back to Mid Michigan. We will demonstrate that women of all walks of life can be strong and independent, while managing a career and a personal life, and can excel in an otherwise male dominated sports world.